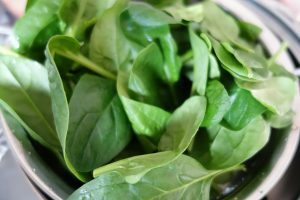 The benefits of spinach are innumerable, and so are the ways you can eat it. 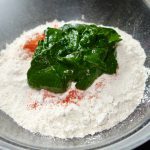 One of the healthy and tasty way of adding spinach to your diet is adding it to your doughs and eating it as a roti/ parantha/ any breads or poori. 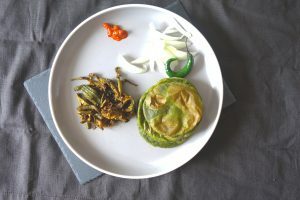 The recipe I’m sharing today is of spinach poori. 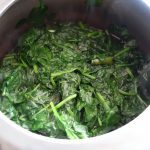 It tastes great and is a good way of making the little ones or even grown ups eat spinach. My daughter loves eating crispy pooris. 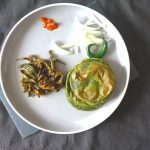 So I create different recipes to make pooris colourful, tasty and healthy. She loves having pink pooris, green pooris, yellow pooris, brown pooris:). These are the ones I have tried, and maybe the next is purple poori or Blue ones!!!! Does that sound gross???Eeewwww!! These kids make you do weird things at times.. and the strange thing is you do it for them….Can you people imagine, she even made me try different shapes of pooris- star /heart/ square and even gingerbread man!!! 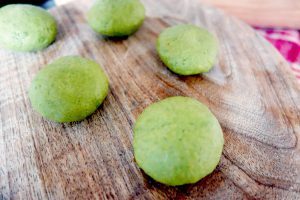 I tried those.. really I did.. they did not turn out well:(. 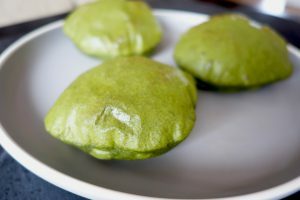 So I’m back to the ball shaped poori’s.But Creativity and food has no limitations.. so maybe one day I’m sharing with you all these colourful and different shaped food recipes.Fingers crossed!! 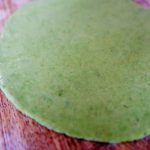 Anyways, so this post is about healthy green spinach pooris, and these are not only for toddlers. 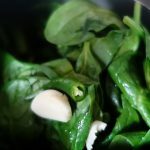 The grown ups can have them as well- make them more spicier and add a little more garlic to enhance the flavour. Kids love poori’s as is, just pop the round balls and eat them, or just roll them and gobble them. But yes if you want to, these poori’s go really well with hing aloo gravy (yummy potato gravy), any raita (Try the pumpkin raita with this )or even as a breakfast with just any yummy pickle. So here’s a tip.. 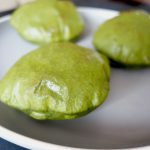 I do not really make an extra effort for these poori’s, but when I plan to cook palak paneer (cottage cheese in spinach gravy), I basically make some (maybe a cup) extra puree, to make the dough for the paalak poori’s the next day.It just saves time, and you have your next days snack/ meal whatever you want to treat it as, ready. .
For making the puree, the step basically require blanching the spinach leaves with some garlic cloves and green chillies, in little salt water for 5-6 minutes and then pureeing them.You can absolutely avoid green chillies if you want to, or add just one green chilli.Thats your choice.Adding chillies to the puree, for making the dough, does not really make the poori’s very spicy, but it adds flavour and a kick of zest to the poori’s. 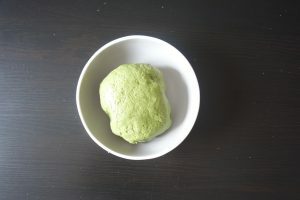 Once the puree is ready, mix all the ingredients with wholewheat flour and knead the dough. 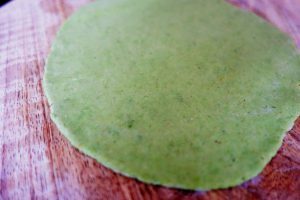 This dough needs to be little harder than the regular dough for the chapatis or bread. Cover with a moist muslin cloth, and keep aside for 10-15 min. 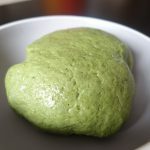 Then roll it and divide into equal dough balls, for the number of poori’s you want.The best poori’s are made with the fresh dough, but still if the dough is little extra, you can cover it and keep it in the fridge to be used the next day.I do that at times! 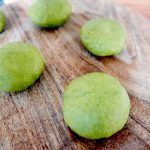 Now roll the dough balls into small flat thin rolls.If you are not good at rolling the poori round.. like I am:(, you can use a bowl or round cutter to make the shape perfect!! Fry these in hot oil.make sure the oil is hot enough, else the poori will not be crispy and fluffy. It will be hard and flat. 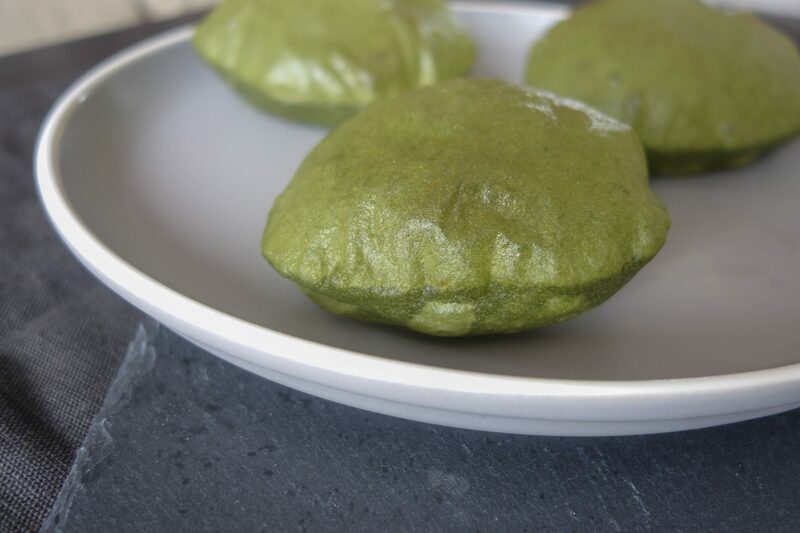 Yummy fluffy Poori's(crispy and soft Indian deep fried breads), with a flavourful combination of healthy wholewheat and spinach- a favourite of kids and as equally loved by grownups. 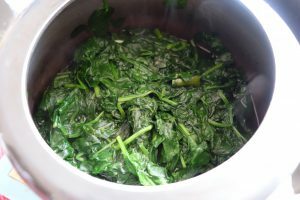 Blanch the spinach leaves/palak leaves along with 2-3 cloves of garlic, green chillies,and 2-3 tsp water, in a covered pan for 5-6min. 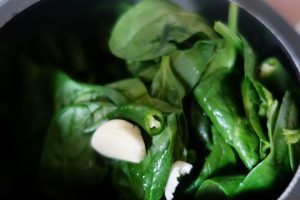 Once cool, blend the above to make a smooth puree. 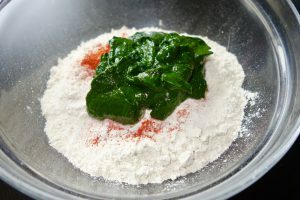 In a deep dish, take all the ingredients for the dough together- Add wholewheat flour, salt, red chilli powder, malai/cream,and oil, and the spinach puree that is room temperature now. Thoroughly mix all the ingredients together. Knead the dough.This is best done using your clean hands. Make sure the dough is not very soft, and neither too hard. Cover it with a damp muslin cloth for 10-12 min. Heat Oil in a separate deep pan or a Kadhai. Now divide it the dough equally , making small round balls.You can oil your hands to make smooth round balls. Now flatten these using a rolling pin, into thin flat round rolls. Slip the roll into hot oil using a slotted spoon.Make sure the oil is hot enough.Carefully splash oil on the top of poori.Once the one side is cooked, turn the poori. This just takes 1-2 minutes. Deep fry all poori's the same way. Enjoy the hot poori's as a snack or meal with pickles, raita or any vegetable. 1.Adding Malai/ Cream makes the poori very soft and crispy, hence I add it. But you can avoid adding it , if you do not want to. 2. 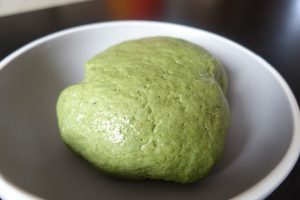 The puree already has water, so you will not need more water to knead the dough, but just incase the dough feels too dry, you can add little water to get the desired consistency.